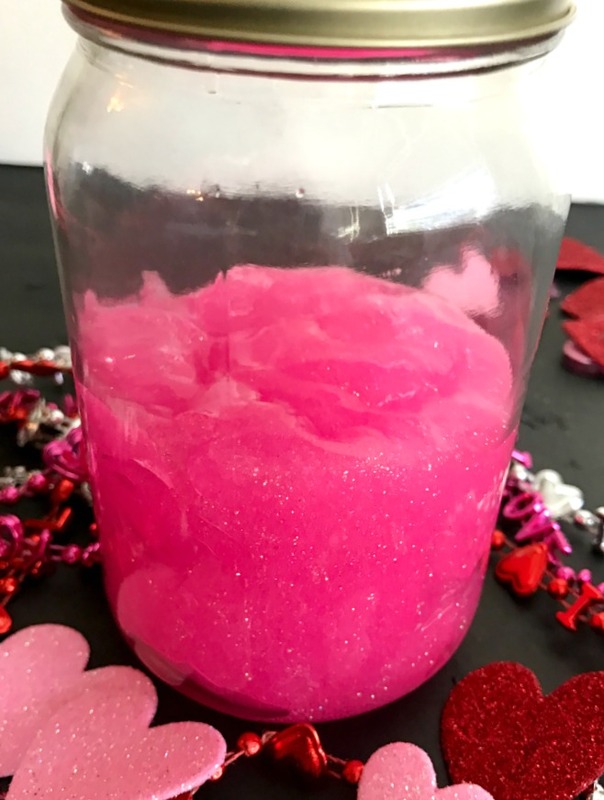 Valentine Slime Recipe With Glitter & Hearts! This Valentine Slime recipe is a fun and easy craft to do with your kids for Valentines Day. 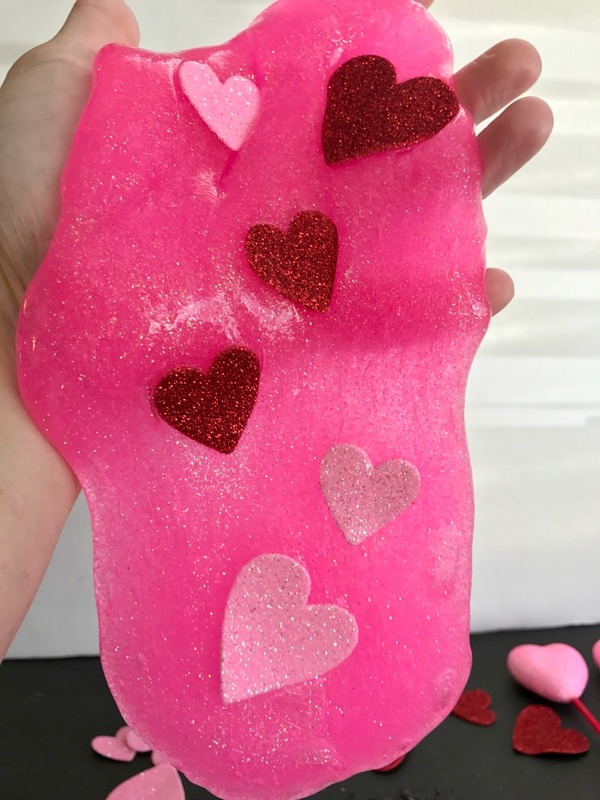 You can make this Valentine slime to pass out to friends or you can just make it as a fun activity to do at home. 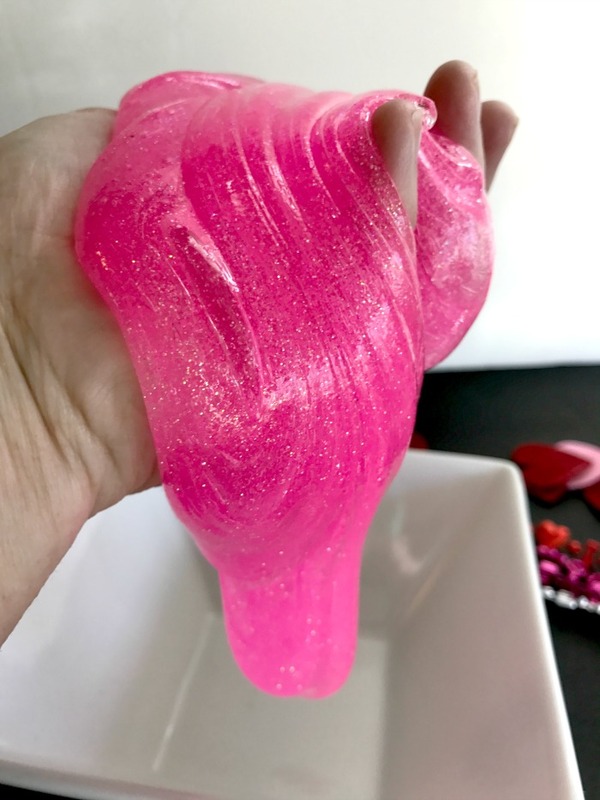 Either way, your kids are going to have lot’s of fun making and playing with this Valentine slime. Valentine Slime Recipes Are Fun To Make! This Pink glitter slime is squishy so you can make fun shapes like this heart we made below! Liquid Starch MOM TIP: This slime or any other slime can easily be made without Borax. All you need is LIQUID STARCH and glue. It’s easy-peasy. Just mix about 1 tsp of liquid starch into 4 ounces of glue. Mix the liquid starch into the glue until you get the consistency of slime that you want. Then dye the slime any color you like. I’ll be honest though. Liquid Starch can be really hard to find in stores. You can pick up an inexpensive container of liquid starch here (the same kind I use). I also like to purchase my glue in bulk so that we can make slime anytime we want. Plus it’s a lot cheaper to buy these in larger quantities. 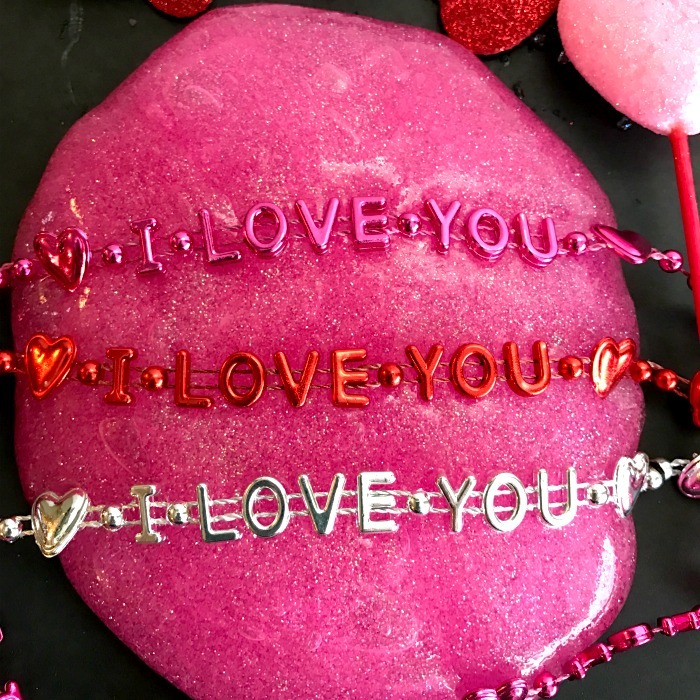 This Valentine Slime Recipe Is SUPER EASY! 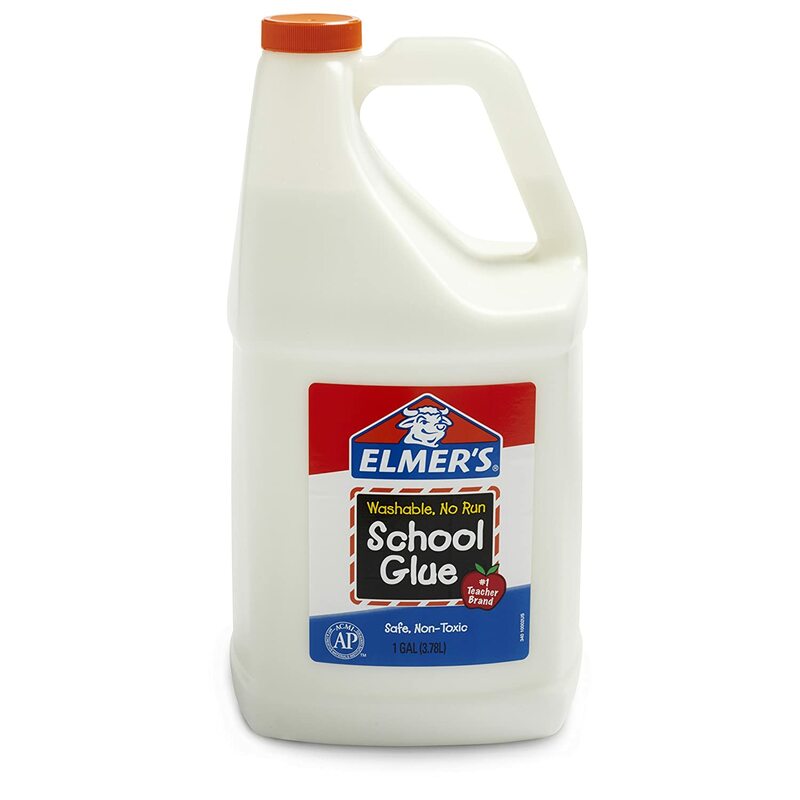 Pour the entire bottle of clear Elmer’s glue into a large bowl. Now fill the empty bottle of glue up with water (this is about 1 cup) and pour it into the glue and stir. Next add the hot pink glitter. You can use as much as you want. We used probably 1/4 cup of glitter. Add about 1 tsp of Borax powder into 1 cup of warm water. Mix well. There’s still going to be a little bit of granules at the bottom of the cup. THIS IS OK. Just make sure you stir everything together well. Slowly pour the borax mixture into the glue mixture and stir. You are only going to need about 1/4 cup of the Borax mixture to get the slimy consistency. DO NOT ADD THE ENTIRE CUP OF BORAX WATER. This will make your slime hard and not fun to play with at all. When you start to get a slimy consistency keep stirring. It will be very, very sticky. This is ok. As you knead the slime together it won’t be sticky anymore. Remove the slime from the bowl and place it onto your table or into a dry bowl. 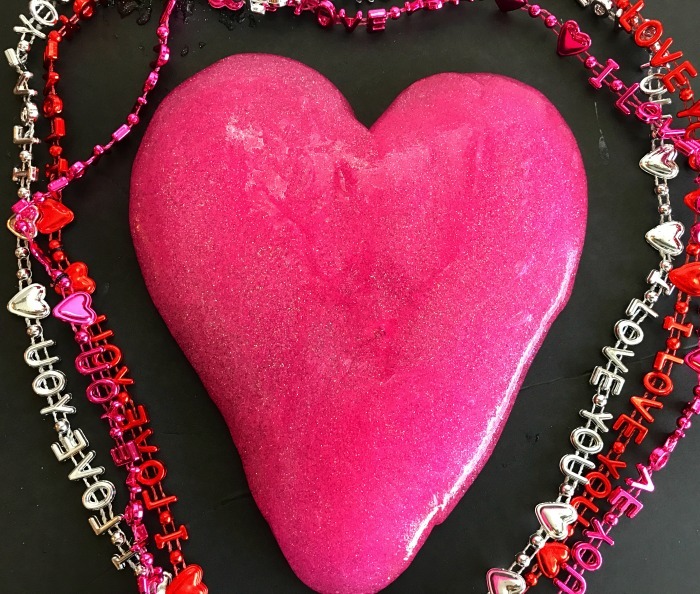 Add in accessories like hearts to your Valentine Slime recipe. You’re ready to play with it! If you store your slime correctly it can last a week or so. I would recommend putting your slime into a ziplock bag and squeezing all the air out. This seems to work best for us. You can also store your slime in a glass mason jar or plastic container. Make Your Slime Last Longer! How fun! Love the colors. Looks like something my nieces would enjoy making and playing with.